Singers reach for their note, guitarists struggle for tone, writers work on their voice, athletes go into the zone. Now, with cartoonists, cartoonists try to find their line. "Hank Ketcham's Complete Dennis the Menace 1951-1952"
Where the ink hits the paper is like where the rubber meets the road. Is it smooth? Will it clot? Will it swoop in graceful curves or get all jangly and skritchy-scratchy? It's all OK, mind you. It's just that the line on paper is how the cartoonist communicates, it's their craft and reason for being, and finding the right, balanced scramble of ink-and-paper interface is a lifelong dream for most cartoonists. 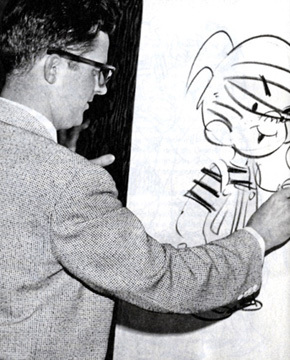 Hank Ketcham, though -- that boy could draw. To this day, cartoonists are not only in awe of his economy of line, but of his cinematic perspectives and compositions. That attention to pedestrian detail. The suburban characters and neighborhood of Ketcham's classic "Dennis the Menace" is likely the most complete world ever rendered in the fewest amount of lines. And he did it without even creating a comic strip. Ketcham's forte was the single "gag" panel, a daily one-shot, and one that rarely works with continuing characters and story lines. Dennis' character was spun off into comic books, animation and even a live-action TV series and movie, and the characters laid down by Ketcham were so indelible that they survived mostly intact. Hank Ketcham worked wonders with the daily "gag" panel of Dennis the Menace. I'LL COME CLEAN here and reveal that when I moved to Hawaii in the '60s, my primary guide was a tattered copy of "Dennis in Hawaii." It remains a surprisingly accurate introduction and beautifully drawn by Ketcham protégé Al Wiseman, published in 1958 to coincide with Hawaii's drive for statehood. I've just discovered that it is also likely the best-selling comic book of all time, as well as the first to send its creative team "on location." 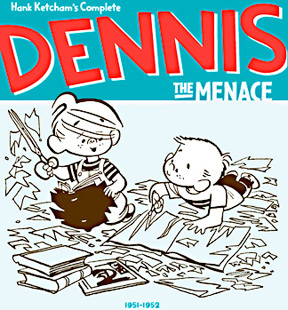 All this bubbles to the surface because Fantagraphics, the publishing company dedicated to preserving the best in American cartoon art, has begun a massive project of reprinting every "Dennis" panel ever drawn. Yikes. The first volume begins on the first day of syndication -- Ketcham had no trouble placing the project, and his sample drawings became the lead-off gags -- on March 12, 1951, and then covers the next two years. "Love and Rockets" comic book illustrator Gilbert Hernandez, commenting online, noted that Ketcham's work was an inspiration because "among all the American newspaper cartoonists who could draw people that LOOKED like people, Ketcham was far and away the best. ... (He) captured real folks in a naturalistic environment the way no on else could. A perfect blend of slickness and warmth." The book makes it clear that the style was there from the beginning, and is quickly refined within a few months. Dennis isn't a bad kid, he's just enthusiastic and mischievous, and the gags use a sophisticated, sly wit that often rides on the perfection of the drawn panel to make its point. And they were funny from day one. The package is designed by Jack Covey and includes a forward by "Mutts" master Patrick McDonnell, another cartooning genius who has found his line in life.